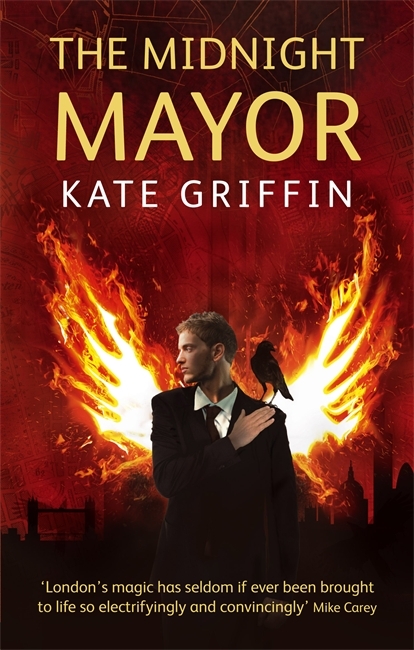 I feel I’ve come rather late to the fair with Kate Griffin’s sorcerers-in-London series, since the first one came out in 2009. I was looking stupidly at A Madness of Angels in a bookshop last autumn, wondering why it wasn’t ringing bells – surely I’d read all the magical-London novels in print? – and was urged by the bookseller to read it because it was brilliant. Well, it took me a long time to read it since the prose is dense, the concepts are devious and the plot twists are many. There was a LOT of doubling back to reread and recalibrate. The plot, briefly, is that Matthew Swift wakes up in a new body in his old bedroom, very troubled as well as bruised and starving, because he’s pretty sure that he used to be dead. His room has a new tenant, who seems horrified to see him when he staggers past her dinner party out of the door in someone else’s clothes, but then he has to concentrate, because a horrific magical creature is loping after him through London’s suburban streets and back alleys. Then his magic comes back, he remembers all that he is, and can do, and his power simply blossoms from his fingertips. He is a sorcerer, not a magician, warlock or a wizard, and there is a difference. 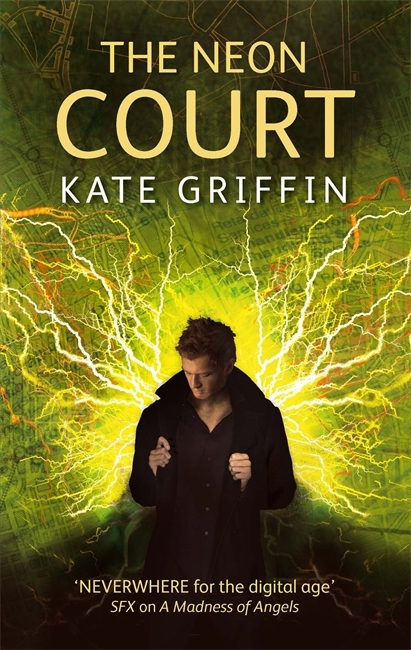 Wizards do book-learning, warlocks are street conjurors, whereas sorcerers are instinctive, creating magic and spells from anything to hand, and this, I suggest, is where the USP brilliance of Kate Griffin’s series lies. Matthew’s quest – because there always is a quest, isn’t there? – is to survive, find out who else is in his brain, and work out who brought him back from the dead, and for what purpose. There is a horrific magical gang war festering in London, and Matthew is very close indeed to the person fomenting it. By focusing on the desperation of chances taken and emergency magic created in a frantic rush, the momentum of the plot keeps up well, despite it being over 400 pages long. How is this novel different from the others in its genre? It’s not as terrifying as China Miéville’s Kraken, though it is definitely dark, and there is much blood. Its hidden-in-plain-sight alternative London settings borrow from Harry Potter, but in a grown-up way, and are set above ground, rather than following Neil Gaiman’s Neverwhere’s belowgroundness. It shares London street knowledge and secret tribes with Ben Aaronovitch’s Rivers of London series, and has the attitude but not the jokes of Good Omens. I think what I like best about A Madness of Angels is its expansiveness. London has been a magical literary location in adult fiction at least since Stella Benson’s Living Alone during the First World War, as well as attracting too many triffids and zombies. Sometimes I wonder just how many alternative magical existences Zone One and the 38 bus route can accommodate. Instead of doing clever things with Tube names, Griffin focuses on particular buildings and structures, some of which are very familiar to even the most casual part-time Londoner. This also helps us wade through the story. The length is the only problem with this first novel, I think. My other half gave up in despair because he couldn’t hack through the undergrowth of text. I read faster so I stayed with it, but it was a struggle until about a third of the way through, and the plot bit hard on my imagination. Griffin’s prose is wordy and repetitive, making the novel much longer than it needs to be, but it is a slow-moving beast taking its time, getting to the end in a satisfying, unsentimental crunch. It’s also oddly androcentric. There are women characters, obviously, since this author is a modern young person, but the story is told and driven by men. I’m in two minds about buying books two, three and four. If I had another long flight ahead of me, I would invest the time to read them properly. The really remarkable thing about Kate Griffin is not that she published four novels in four years, but also publishes prolifically as Claire North, and as Catherine Webb (her real name), and has a day job in the theatre. That’s what I call a Dickensian amount of polymathery. No wonder writing about London suits her so well. 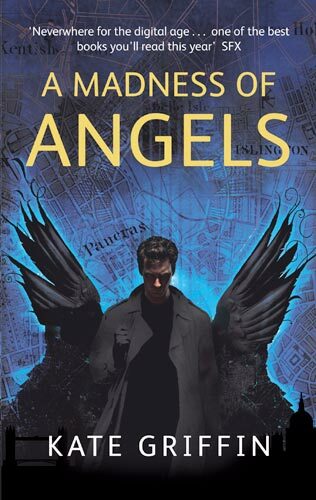 Kate Griffin, A Madness of Angels (Orbit, 2009). I’ve not read (yet) the others in the Matthew Swift series, but you might want to know they exist: The Midnight Mayor (2010), The Neon Court (2011), The Minority Council (2012). Like you, I found this difficult to get into. I was looking at my copy a few days ago, thinking that it must go. But now I shall try again. I also have Kitty Peck and the Music Hall Murders by I guess the same Kate Griffin (I couldn’t see it on her website) and her various YA novels under her real name. It’s a while since I read them but I remember the Sam Linnifer novels in particular as very enjoyable – intricate plots, a great main character and a convincing world. The Laenan Kite novels are not quite as good but well worth a read on a Bank Holiday weekend.